Whatever bit of the city you are in, you won’t be too far from a green space, and exploring them won’t cost you a penny. Whether you’re looking for a lazy Sunday afternoon hanging out with friends or a book, the perfect picnic spot, or a running track, take your pick from the list below, kick back and wind down. Up until the time, Eco Park came into existence; Central Park in Salt Lake was one of the largest parks in the city. Owned and maintained by the government, this is the perfect place for a day out with family or friends. They have a large play area for children as well as a flower park for nature lovers. This one opened its gates in 2013 and is now the largest park in Kolkata (I have yet to cover the entire landscape of Eco Park). The newest addition is their Japanese garden, with its very own Japanese restaurant. Those who do not wish to experiment with Japanese food can always stop by Café Ekante. In the truest sense, this place isn’t exactly a park. However, it does have the most beautiful view that captures the essence of Kolkata. From the Riverfront Park in Babughat you can see a huge stretch of the Hooghly River with the magnificent Howrah Bridge and its new sibling, the Vidyasagar Setu flanking both sides. The outside area is dotted with numerous food carts so you can grab a bhelpuri or sandwich on the go. This is an ideal place to come watch the sunset over the Hooghly. Situated right behind the National Library in Alipore, this is a flower lover’s paradise and very popular with morning walkers. It’s been around for ages, look out for their annual flower shows. 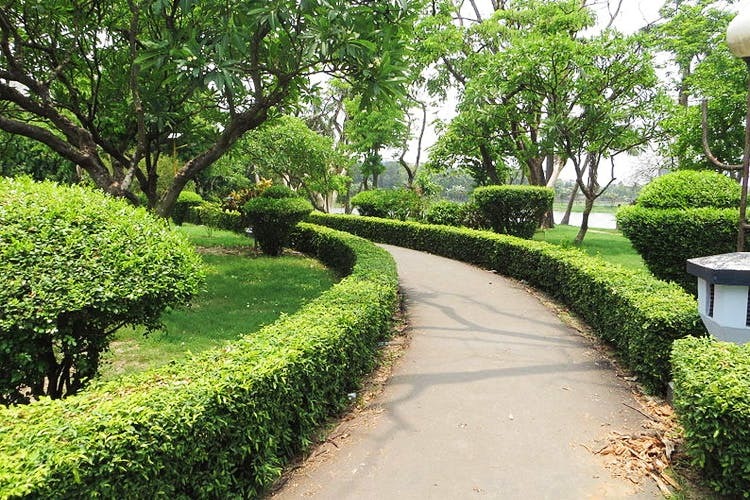 This landscaped park is right across the road from the Maidan metro station. It’s a pit stop for those in the area who want to catch up with colleagues or friends post work. Do look out for the tiny pond and pagoda which add a peaceful vibe to the place. This park was formerly known as Minto Park (some locals still prefer to call it by that name) and was later renamed Shaheed Bhagat Singh Park. Located right next to Belle Vue clinic, this place provides much-needed zen in one of the noisiest areas in Kolkata. This one is right beside Kolkata’s famous lake on Southern Avenue. It’s a huge favourite with morning walkers and has several good rides of children in a corner. While you’re here, do check out some of the local vendors selling amazing street food. A slightly larger version of the Riverfront Park, the Millennium Park runs along the eastern bank of the Hooghly River. This park is over 2 kms long and provides for a family friendly evening out. With swings and slides for children, a walkway for the elderly and ample photo opps for the young crowd, Millennium Park can get a tad crowded and noisy. It’s not for those looking for peace and quiet. This used to be one of the most popular places for hanging out over jhal muri and adda. It was an egalitarian space where everyone – from neighborhood aunties and young couples to office goers and jhal muri sellers would hang out. But of late, several cricket clubs have slowly inched in and taken over corners, built pitches etc. A walking and jogging track has also made inroads into the space. It has also become a spot for Durga Pujo pandals. Now it is not really as colorful and open as it used to be. It still has some interesting murals inside, and the benches at intermittent intervals in case you want to take a break from your morning fitness routine.